Nailsea glass was originally an inexpensive means of introducing radiant colour into farmhouse and cottage. This was because the basic glass was pale green bottle-glass or, from about 1815, crown glass. Such glass was not subject to the excise tax of sixpence per pound levied on flint-glass. Colourful curios in many shades of blue, green, amber and red, which might be flecked, mottled or striped, were made not only at Nailsea in Somerset but by the glassmen of Sunderland, Newcastle, Stourbridge, Wrockwardine Wood in Shropshire, Alloa in Scotland and elsewhere. 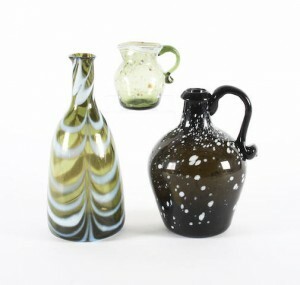 Pictued: Two Nailsea or Wrockwardine-type jugs and a flask, early-mid 19th century All in green glass, the jugs with white speckled decoration, the smaller with white trailed rim, 21cm and 9cm, the flask with white combed decoration. Sold for £937 inc. premium at Bonhams, Oxford 2012. Image Copyright Bonhams. So greatly alike were their productions in form and colour that collectors can do no more than group them under a generic term and for this purpose the glass centre of Nailsea has been chosen. Pictured: Three Nailsea flasks – The first of rounded body and of crimson colour, with a pattern of white wavy lines, the second of smaller, more ovoid form, of pink colour with cross-hatchings of light blue and dark blue lines, and the third flask of white colour with patterns of vivid pink and black colouring. Sold for £240 inc. premium at Bonhams, Chester 2009. Image Copyright Bonhams. Many Nailsea glass fripperies were hung upon parlour walls in a day when pictures were few and costly. 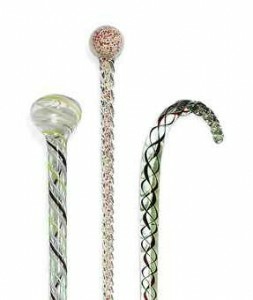 There might be quite an array of colourful glass walking sticks, for instance, and swords, pipes, hunting horns and rolling pins. Hollow canes with knob handles were made from drawn tubes of clear crown glass and filled with ” hundreds and thousands ” then known as comfits. Examples with the original comfits intact show them arranged in two-inch bands alternating in red, white and blue, the ferrule plugged with a cork. Pictured: Three glass Nailsea walking sticks 19th and 20th century. Sold for £250 at Christies, London 2013. Image Copyright Christies. The earliest walking sticks, however, were in pale green bottle glass tapered at the ferrule end and sometimes twisted. Later they were made in clear and coloured glass and were cylindrical rods, with the ferrule end merely rounded off with a tool. It may be noted that those with shepherd’s crook handles are sheared off with a cold iron, suggesting a common source. The rod itself might be twisted in relief or plain surfaced. The majority of existing examples are enriched down the centre along their entire length with spiral threads of coloured enamel, causing a very slight ridge on the surface of the glass: if this ridge is absent from a stick with such spiral ornament the rod will be found to be in flint-glass and may be assumed to date later than 1845. Spiral ribbons of enamel are also found. In other walking sticks the colour threads are spiralled around the surface. Pictured: A Nailsea glass pipe, with pink, white and blue combed decoration, 28cm long (bowl reduced), and a similarly decorated flask and rolling pin. Sold for £164 inc. premium at Bonhams, Oxford 2003. Image Copyright Bonhams. Giant tobacco pipes of fantastic shape were originally intended to decorate the display windows of tobacconists’ shops : by 1820 they were in demand as ornaments for the home. These had small bowls and the solid stems were of coloured or opaque white enamel twist. Length varied from ten to twenty-five inches with occasional giants measuring more than a yard in length. Other pipes, dating from the mid-1840s, were made from translucent pot-glass with heavy, solid multi-knopped stems containing air bubbles and slender mouthpieces of equal length : the bowls of these resemble the shapes of the newly introduced briar pipes. Ornamental tobacco pipes were blown in coloured flint-glass from the late 1840s. Slender poignards were made with round blades of translucent glass enclosing colourful spiral threads. All those I have noted have had circular guards in blue, the ribbed grip in green, the pommel in transparent glass. Adaptations of ceremonial dress swords were made too, with raspberry prunts on the hilt and the blade of triangular section with a broad red stripe down one side. These measure from three to four feet in length. Yet another type is in blue glass, with a square blade spirally fluted and the tip edged to simulate blood. In the same group may be in cluded the glass mace, its hollow, crown shaped head welded to a colourful spirally twisted staff. Early maces were in Bristol blue decor ated with painted enamel and gilding. Some possses finials, but it is improbable that these date earlier than about 1850. Coachmen’s and huntsmen’s horns were hung up along with riding crops to enrich many a tavern parlour. The coaching horns with widely expansive mouth-pieces and measuring from 40 to 45 inches in length were in blue or amber, sometimes spirally ribbed, and in a yellowish glass intended to resemble burnished brass These date from the late 1840s. Horns with the tube curved into three loops are also found, and bugles. All of these if expertly manipulated will produce their appropriate notes. The riding crops measured about 30 inches in length and contained broad white enamelled bands. Pictured: A Nailsea glass rolling pin with blue & white trailed decoration. Sold for £125 on ebay, February 2015. The rolling pins for which Nailsea is celebrated were made at first in ordinary bottle glass for use as salt containers and hung near the fire. Later, in a clearer bottle glass, they were used also as containers of tea and the standard rolling pin measuring 15 inches in length and 2 inches in diameter will hold exactly one pound of tea. 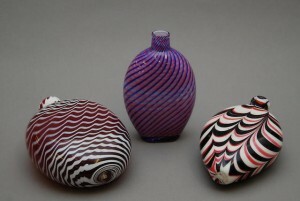 These were blown in purple, blue, mottled and striped glass, and by 1820 they were painted and inscribed in coloured enamels and in gold and sold as fairings, usually containing comfits. They were hung upon parlour walls and prized as emblems of good luck, only to be taken down when pastry was ceremoniously prepared for a wedding feast. Such pastry was believed to bring good fortune to all who ate it. The rolling pin used to hold salt or tea or comfits was fitted at one end with a ground-in ballheaded stopper of glass: when the purely ornamental rolling pin came into fashion both ends consisted of matching solid knobs. The parlour shelf was decked out with its share of Nailsea trifles. Candlesticks were made in a variety of designs. One now rare type, found in a full range of colours, was hollow from base to socket, being hand-tooled from a short length of glass tube. One end of the tube was opened into a spreading foot, trumpet-shaped or highly domed, with a welted rim, and the saucer-shaped socket also was strengthened with a thick rim. The stem might be ornamented with shallow ribbing, sometimes twisted, or an expansive central knop. Hollow candlesticks were also made from tubes of latticinio work. These candlesticks measure from about six inches to a foot in height. Jacob’s ladders were delicate ornaments intended for the mantelshelf from the late 1840s. Examples seen have been in translucent flint-glass, blue, red, amethyst or clear. A Nailsea Jacob’s ladder consists of a tapering openwork of spiral or glass like an elongated wire spring, some nine inches tall and two inches across the top. This flimsy ” ladder ” twines around a central stem, equally slender, attached to it at the top and base on a highly domed foot with a folded rim. Flasks for toilet waters and spirits constituted a considerable Nailsea production, particularly the flattened baluster or pear shape decorated with curved loopings or quillings, white or coloured, in numerous variations. Collectors take a special delight in the gimmel or twin flask with two spouts, usually with their necks pointing in opposite directions but occasionally with them parallel. There is evidence that thick and heavy Nailsea gimmel flasks fitted into saddle holsters, easily accessible for refreshment on a journey. The sides of holster gimmel flasks sometimes display signs of prolonged friction. Nailsea flasks are most usually found with pink and white spiral decoration or white latticinio loops : a crimped or petal foot may be included in the design. Flasks to contain toilet waters or perfume might be shaped to resemble the hand-bellows formerly used at the dressing table for powdering the hair. These are found in clear flint-glass garnished with notches, loops and trailed work, and in coloured Nailsea glass with loops and trailed work in white enamel. Giant bellows flasks were midnineteenth century productions. The flask itself was made in clear flint-glass with translucent red and white loops and frilling, and was mounted on a stemmed circular foot. Sometimes the nozzle was expanded into a deep saucer shape and crimped. The vessel was filled with perfumed water which slowly evaporated, pleasantly scenting the room. The front might be decorated with an applied motif such as a gilded monogram or an enamelled posy. Bells which ring with the pure resonant tone associated with flint-glass were made from the Regency period onwards. Colour combinations are numerous but the clappers are invariably in fine clear flint-glass. Authentic bells measure between nine and eighteen inches in height and include the following colour combinations : blue tinted bell,spirally ribbed handle in pale yellow with opalescent triple-knopped finial; bellwithpink strands on an opaque-white ground with a moulded opaque white hand as a handle ; bell with white stripes on a translucent red ground and with an opalescent blue handle ; red bell with a colour-twist spiral handle ; green bell with a white opaque twist handle ; opaque white throughout, sometimes ribbed; translucent white bell with a clear handle. Whatever the form, Nailsea glass is colourful and dainty. It is small wonder that it is selected by so many collectors. It catches the eye in any company.